Fundamentals: Yesterday, the S&P settled at the highest level since April 18th and the NQ at the highest since March 20th. While each is more than 4% and 6% from their all-time high, the Russell finished at the highest since March 13th and sits just more than 1% from its all-time high. As bullish as we have been, today we will discuss some of the attributes holding the S&P back. First and foremost, the recent Dollar strength can squeeze 2nd quarter S&P earnings; many companies have operations overseas and pointed to a weak Dollar in the first quarter as boosting earnings. Those earnings will be worth less in Dollar terms and they rely on demand from regions whose currencies are now worth less. The Russell 2000, on the other hand, is more domestic focused and allows reduced exposure to Dollar strength. We love the fact that the banks have finally begun to wake up, the XLF gained 1.48% yesterday and is up 4.2% on the week. JPMorgan and Bank of America each gained more than 2% yesterday. Rising yields have been generally favorable for banks, the 10-year Note reached 3% again yesterday. However, the flattening yield curve squeezes net-interest margins. Though rising yields can be favorable to one sector, this is not the case for many companies that carry a heavy balance sheet. There is no need to look past the second half of April; the S&P failed at its current level and LIBOR began a sharp ascent. Furthermore, it weighs on consumer borrowing costs; consumer demand and credit are both questionable components at this stage in the recovery cycle. Crude Oil has put in a tremendous week up nearly 3% but also points to rising gasoline prices weighing on that aforementioned consumer as summer driving season heats up. Yes, we are still bullish and a drop of one or even two percent today would not change that. However, it is important for traders to remain smart at these levels. If you have followed us and were a buyer over the last week, it is important to capitalize and lock in some profit. The big focus today is CPI data due at 7:30 am CT. We watch the Core number most closely which excludes food and energy prices. The MoM is expected at the +0.2% benchmark while YoY is expected at +2.2%, the highest level since last February. The Federal Reserve did take some pressure off this number after discussing ‘symmetric inflation’ goals in their statement last week. They implied their willingness to allow inflation to run hot. Where a beat in February or March would have caused immediate selling, this should not be the case today. Still, a very strong number would likely weigh on the market. Earnings season has rounded third base and Disney is down almost 2% this morning after reporting yesterday. The highlight of the week is NVIDIA who is due to report after the bell today. Will they support this recent breakout in the NQ? Technicals: The S&P broke out and closed above major three-star resistance at 2684.50-2688.50 and the NQ did the same above 6867-6867.50. The tape is firm though off overnight highs. Yesterday was everything we wanted to see from price, though the volume at this level and overall on green days remains subdued. On a positive note, volume did pick up on the move out above the major three-star levels yesterday afternoon. This is different than the grind through the same area in early April. It is important to not lose focus on strong resistance just above that aligns with the 100-day moving average at 2708.75-2709.50. Furthermore, major three-star resistance sits above here, and the entire area aligns with a trend line from the all-time highs. While this brings a point in which to take profit, a close above 2718.50 is extremely bullish and will likely invite the strong volume that these rallies have missed. Fundamentals: A large part of yesterday’s gains came late in the session on Tuesday after President Trump did no renew the Iran Nuclear Deal. Price action has stayed steadily bid on rising geopolitical tensions involving Iran. Syria is front and center again after Iran launched a rocket attack on an Israeli army base and Israel responded with heavy strikes of its own. Tensions between the U.S and Iran are of course heightened but also between them and their Middle East counterpart, Saudi Arabia. With today being Thursday, pullbacks should become buying opportunities as sellers are unlikely to step up ahead of the weekend. Yesterday’s EIA report was fairly neutral given the API report Tuesday night and the increase of 91,000 bpd in the lower 48 states. However, the headline data confirming a draw was enough to keep market participants focused on geopolitics. Technicals: We have been Bullish in Bias with a target of 72.35 and this remains. However, our tune has not changed; traders should have locked in some portion of their profits at these levels. As long as price action stays above 70.61-70.84, this market remains a buy into the weekend. Yesterday’s initial spike was 71.17 and price action is more bullish above here. Remember, the long-trade is extremely crowded now, and this means the market is very susceptible to quick waves of selling. Fundamentals: This morning is the highlight of the week for the metal with the Bank of England and U.S CPI in focus. First, the BoE left rates unchanged as expected, however, they did point to a slowdown in inflation happening at a quicker pace. Gold traded higher on the statement’s release. Arguably, more important this morning is U.S CPI. The Core read excludes food and energy and is more closely watched; MoM is expected at the +0.2% benchmark and YoY is expected at +2.2%, the highest since last February. A stronger than expected read will increase the Dollar and weigh on Gold as it signals the Federal Reserve will potentially hike rates at a faster pace. The Fed was hawkish on inflation at their meeting last week. However, they essentially implied their willingness to let it run hot. Still, Gold has not benefited from this yet; while the combination of this landscape is very bullish upon a CPI miss it should limit the downside upon a beat. Weekly Jobless Claims are also due at 7:30 am CT and the Federal Budget is due at 1:00 pm CT.
Technicals: Gold is trying to hold out above the 200-day moving average at 1315.1 this morning. While the metal has built an extremely constructive base above the psychological $1300 mark and at support at 1303.6-1306.6 it has not only failed to hold price action above the 200-day moving average it has not really settled above it since it was selling off on April 30th. Watch for a move above resistance at 1323.9 to welcome buyers as it essentially secures a close above the 200-day. Fundamentals: As storage season hits head on, expectations for today’s EIA read vary widely. We are looking at a rage from +81 bcf to +94 bcf. Look for a number below or above this range to encourage a directional move in the near term. We still remain intermediate to long-term bullish Natural Gas. Technicals: Price action could not sustain above 2.7494 and for this reason coupled with the storage data we are again Neutral. As we remain longer-term upbeat, there is strong value near the 2.66-2.69 level. Fundamentals: The treasury complex was under pressure early in the session and investors were risk-on equities. Solid demand on the 10-year auction stopped the bleeding. Price action is edging ever so slightly higher this morning on dovish comments on inflation from the Bank of England on their monetary policy statement after leaving rates unchanged as expected. The big focus this morning is now U.S CPI due at 7:30 am CT. The Core read excludes food and energy and is more closely watched; MoM is expected at the +0.2% benchmark and YoY is expected at +2.2%, the highest since last February. A strong number will again put pressure on prices and encourage the yield to hold the 3% mark. 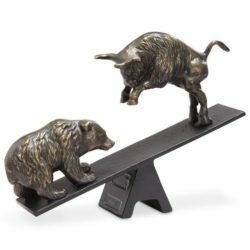 Weekly Jobless Claims are also due at 7:30 am CT and Federal Budget Balance is due at 1:00 pm CT.
Technicals: Pressure has subsided into this morning, but traders still must approach this market cautiously on either side of the trade. We remain upbeat and believe in the upside from our rare major four-star support but must exude risk management by keeping or near-term Bias more Neutral. If you have any questions about markets, trading, or opening an account please let us know!